Mahmoud Badr "owns" the Egyptian street. The 28-year-old activist in sneakers, jeans and a worn-out polo shirt invented the magic formula that drew millions of Egyptians out to demand the overthrow of Islamist President Mohamed Morsi. Now he is determined to ensure all their demands are met. On the day the army stepped in to remove Morsi last week, Badr and his two twenty-something co-founders of the "Tamarud - Rebel!" movement got a phone call from a general staff colonel, inviting them to meet the armed forces commander-in-chief. Speaking to Reuters in a bare suburban high-rise apartment lent to his protest movement by an obscure political party, Badr said it was their first contact of any sort with the military. They had to borrow a car to drive - unwashed and unshaven - to military intelligence headquarters, where they were ushered into a room with generals, a grand sheikh, the Coptic pope, a senior judge and political opposition leaders. Far from being overawed, Badr was soon arguing with General Abdel-Fattah El-Sisi about the military's roadmap for a political transition, and rejecting his suggestion that Morsi should call a referendum on his continued rule. Millions of people were demonstrating for the recall of the president, not for a referendum, the activist told Sisi. "I tell you, sir, you may be the general commander of the Egyptian army but the Egyptian people are your supreme commander, and they are immediately ordering you to side with their will and call an early presidential election," he said. The general surrendered. A bunch of kids in T-shirts had changed the course of the Arab world's most populous nation by mobilising mass protests against the ruling Muslim Brotherhood, then threatening to turn on anyone who resists their demands. "We own the streets because we stand with the people and the will of the people, and we will always do so," Badr said. Like many activists of the Facebook generation, he cut his political teeth in the uprising that toppled veteran autocrat Hosni Mubarak in 2011. 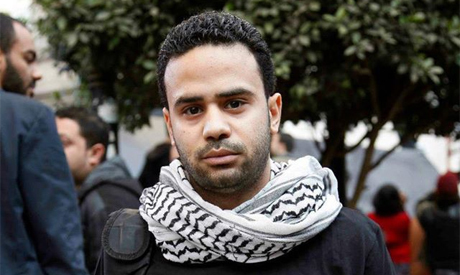 He started working as a journalist and voted for Morsi a year ago but became disillusioned. He told the generals that if they opted for a half-way solution, they would be lost. If they stuck to the referendum idea, he and his movement would walk out. "I don't have a blank cheque from the people," he told Sisi. "People signed Tamarud's petition for an early presidential election so I can't go out and tell them anything else. "If you are worried about the Brotherhood's reaction, they will also refuse a referendum, so in that case you will lose both sides. Win the Egyptian people!" A senior military source confirmed that Sisi dropped the idea of a referendum in deference to Tamarud's argument. Badr, who is not shy of saying he has presidential ambitions in the long term, was elated by his sudden power. "The idea that you are drawing the political map of your country that we believe is the most important nation in the Arab world is so great," he said. A sign pinned on the wall proclaims: "Winners never quit, and quitters never win." It seems hard to believe that two young journalists and a student, armed only with laptops and mobile phones, succeeded in two months in launching a mass movement where Egypt's divided opposition parties had struggled to gain any traction. Badr put it down to sheer hard work that he, Mohamed Abdelaziz, 28, and Hassan Shahin, 23, had put in. "No one did what we did," he said. "Most groups held conferences or at most a protest in downtown Cairo, but we toured the country and went without sleep for days so we will not give up, and we will continue inshallah (God willing)." Tamarud activists scoured towns and villages collecting signatures on a red-printed petition demanding the recall of Morsi. They say they got 22 million signatures with names, signatures and national identity numbers, nine million more than the electors who voted to elect the president. No one has checked the numbers, but they invited the United Nations to send observers to verify the petitions. As the movement grew and called for mass demonstration on June 30, the first anniversary of Morsi's inauguration, new, less familiar recruits permeated its branches. One Tamarud activist who spoke to Reuters said she resigned three days before the giant protest because she was concerned that the secret police and former Mubarak supporters were infiltrating the movement. "Suddenly, the faces had changed," said B.A., who asked not to give her full name for fear of retribution from the security services. "Many of the people I'd worked with left, and some of the new faces I knew were felul (remnants), nostalgic for Mubarak, or justifying the work of state security." The Amn Dowla state security agency, which detained and tortured dissidents under Mubarak, especially Islamists, is widely hated and feared. Formally dissolved after the 2011 uprising, it was renamed and remains mostly intact. Muslim Brotherhood leaders have alleged that former Mubarak cronies and secret policemen funded and encouraged Tamarud. Ahmed Shafiq, Mubarak's last prime minister and a former air force general now living in Abu Dhabi and accused publicly by Morsi of pulling strings behind sabotage in Egypt, says he was in close touch with the protesters. He predicted on July 1 that Morsi's reign would end within a week and said he was "in continuous coordination with colleagues in Cairo". Badr shrugged off any suggestion that he, or his movement, could have been manipulated by Shafiq or covert forces. Other groups might have jumped on the bandwagon, but Tamarud remained in the driver's seat, he said. Activists noted that while the Brotherhood provided transportation, food and drink for their supporters, sitting in outside a suburban Cairo mosque, the Tahrir Square crowds were given only whistles and red cards to "send Morsi off". Badr resisted any suggestion that Tamarud should call on its followers to leave the streets and go home, saying their mobilisation was keeping vengeful Brotherhood supporters at bay. "As long as they (Brotherhood supporters) see lots of people on the other side of the street, they will stay in their place," he said. The Tamarud leaders have worked closely with senior liberal politician Mohamed ElBaradei and were elated when, during the interview, the interim president's office called them to say the former U.N. nuclear agency chief would be named prime minister. They jumped out of their chairs, slapped high-fives and broke into a chant of "The army and the people, one hand!" "Baradei is our Bob (daddy), the leader of the revolution," Badr said. "He won the Nobel and we will take it as well." Their joy proved premature. ElBaradei's appointment was held up by resistance from conservative Islamists who make awkward bedfellows with the young revolutionaries. But they are too high on exhaustion to be discouraged. "Hope is always there. It can come and go, but it is always there," Badr said, citing an Arabic poem. He added in his own words: "By our willpower, we will turn hope into action. This revolution will succeed, this generation will not be defeated." You will be remembered as the vilain who brought the mubarak gangs back to power! I'm afraid my friend,Mahmoud Badr, from what is happening, the reaction of the army , the closure of tv channels, and the military coup to remove the president n not dare going to election to do so, all these is enough to put u on the wrong side of history, u will be remembered as the vilain who sabotaged democracy in egypt n help bringing back the gangs from mubarak regime back in control. No one will envy your position.